Certified homes under the Built Green, Energy Star or LEED for Homes programs proved to be a strong selling point for builders in the Seattle and King County real estate markets. In Seattle, the data showed that certified homes sold for 8.5% more per square foot and sold in 22% less time than non-certified homes. In King County, certified homes sold for $72 more per square foot and in 7% less time than other new construction homes. In summary, the true “green” trend is viable and happening in Seattle and King County. It is being defined by smaller homes that offer higher quality finishes and more efficient design. Green homes were almost 600 square feet smaller than non-certified homes. Are you interested in owning a “green” certified home? If so, here is your opportunity to work with the areas most talented, leading edge green builder designer and architect. 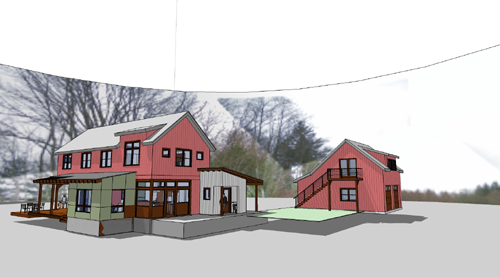 YS Development and De Forest Architects have united their talents coming together for an exciting newly conceived pre-sale project in Woodinville. Become part of the team! Dey Farm – located in Hollywood Hill in the heart of Woodinville’s agricultural rich wine country. Homes constructed with ICFs (Insulated Concrete Forms), are homes built with a super insulated concrete shell, which spans from the basement floor to the eaves. This superior, insulated shell makes for more comfortable climates. These homes can be constructed more quickly while using much less lumber, helping to preserve forests. When finished, these homes use 40% – 60% less energy to operate, saving homeowners money. By consuming less energy, ICF homes put less of a demand on our environment’s quickly dwindling fossil fuels.